I don't know if the video will work, but I'm hoping. As most of my friends know, my husband and I will be welcoming our first child in September, so I'm going to be sidelined from competing for several months. We've been trying to decide how best to utilize my 3 rodeo horses during this 7-8 month break, since none of them enjoy standing around doing nothing. Possibly the toughest one to find a new part-time job is Fred, since he's only 14 hands and extremely ratey so very hard to ride. We decided a while back to offer him to the young lady who's been running my 26 year old gelding the past two years in hopes that she could at least ride Fred at home and pony Joker to keep them both in shape and happy. If it worked out to where she could run barrels or poles on Fred, that would be even more awesome but we weren't counting on it. 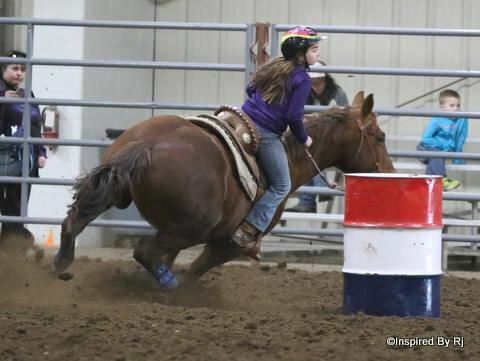 Her parents brought her to a barrel race Saturday so she could ride Fred and my most accomplished rodeo horse, Chance. We started her on Fred, just riding around outside and they clicked so well that her dad went in and bought her an exhibition. She was NOT HAPPY with him but we talked her into doing it at her own pace - trot if she wanted and could get Fred to agree. They started off at a slow lope but picked up the pace through the whole pattern and we were all amazed at how great they looked together. After the exhibition, she spent most of the day trying to talk her dad into going home to get the trailer so they could take Fred home for the summer right away! She was also trying to plan which youth rodeos to run Joker at and which ones would be better for Fred, so we are excited to share the little red horse with our favorite youth rider this year. I'm also adding a picture of them turning the first barrel in their youth run, which didn't go as well as the exhibition since Fred is super ratey indoors and their timing isn't quite perfect yet, obviously. Those wide open outdoor pens will be a better fit for them, but I just couldn't help but share our excitement and helping create another great youth rodeo team! You have just started another barrel racer for life. You might have a tough time getting your horses back from her. I am glad you have found something for your horses to do. 4 of mine are at Ellsworth Equestrian College this winter for lesson horses. I thought it was better than letting them sit all winter here in northern Iowa. I bought Fred 2.5 years ago DIRT CHEAP as a fix-it project due to severe gate issues. He had a 1D record, but had gotten flat out dangerous at the gate and was known to run his rider into every fence available to avoid going in the pen. We spent a lot of time just figuring out his needs (feet, nutrition, etc), got him feeling great, always had my husband there to walk us to the gate, and he was a key part of my 2017 rodeo success with almost no gate issues. He's been wonderful so far this year and since her dad or older brothers will always be available to walk in with them, I think they'll get along great with Fred.